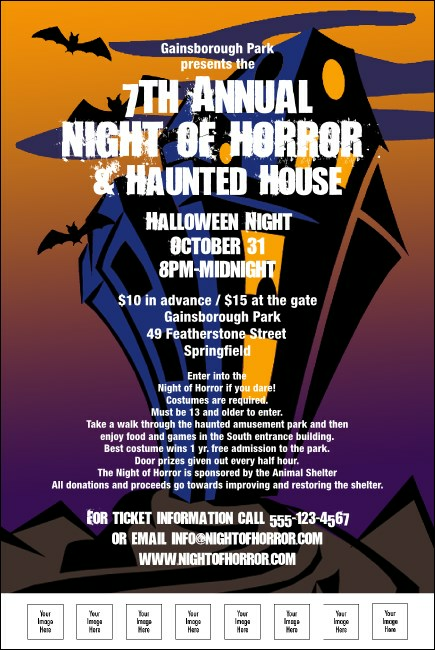 Conjure up a bunch of ticket sales when you advertise your All Hallow’s Eve event with the Haunted House Poster 003. Sunset falls upon a deserted mansion surrounded by bats, setting a playfully spooky scene for party details. Eight image upload spots line the bottom, offering an opportunity to showcase sponsors. Size measures approximately 11.46" x 17.18"
Publicize your seasonal event with freakishly fun flair! Browse loads of poster designs on TicketPrinting.com.